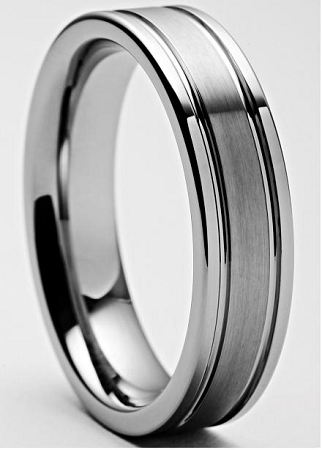 Simple yet classy are just a few words to describe this Renzo 5mm brushed center Tungsten Ring. This style also comes in a 7mm. Bought as a gift for someone who like trying new things. Tungsten carbide is not very common, and it is supposed to be the hardest ring material available (even if somewhat brittle), so there is some symbolic value there. It came in a simple black velvet box with white lining. Nice heavy feeling to the ring, very smooth on the inside. Very affordable – not much risk in buying this. There was no tax or customs duties added on delivery. Bought it for my fiancé he absolutely loves it! 8.75 would have been perfect but 8.5 works. Great quality and fast shipping! Highly recommend buying from here! The ring is great looking, size is correct and the price is great. I looked at similar rings in the jewelry stores and they were priced at $199 and up. I will bye another ring from Tungsten Fashions when the time comes. This ring looks like it should cost 5 times what I paid for it. It's very well made and the size is exact. we love our rings. will be happy to wear them for the rest of our lives. I ordered the ring in a size a bit too small. Returning it for a larger size was super easy and now that I have the proper size, the ring looks great. I love the slightly narrower 5mm width as opposed to the 7mm. Love the ring and the great service! Thank you!! Great quality and super fast delivery even w/ the engraving!! I purchased both this ring and the 7mm version for my and my fiance's wedding bands. The rings are great quality and the engraving on ours looks perfect! I couldn't have asked for anything better. The customer service for the company is incredible, and I could not praise them enough! Everything came exactly as described, and I'm sure had there been any issues, that they would have been taken care of without any hassle. Great company, great products. Finally pulled the trigger and bought this ring and I am glad that I did. Great fit, great quality, great look and great service. I had originally ordered the 7mm band but when I got it, I found that it was too big for my hand. They quickly processed my return (very easy) and sent me the 5mm band no questions asked. Will definitely buy from them again. One note: my ring has a slightly darker finish than what appears in the picture - but it still looks great! My husband and I purchased this and we are very very satisfied. We're now planning to purchase a bracelet!! Thanks! Got the matching set and very happy! Got the other for my hubbie and we love them both. This is just as promised at a great price my fiancée loves it we got matching rings. Ring arrived very well packaged & in a timely manner. Would never have guessed this ring is only $50. Excellent quality and it fit perfect. Would not hesitate to purchase from here again.